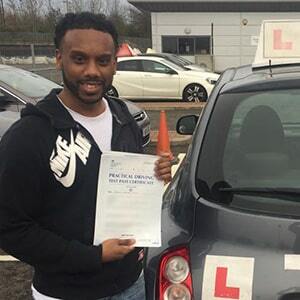 If you’re looking for a driving school in Enfield that can help you to get your licence in weeks rather than months, PassMeFast could be just what you’re looking for. With courses for total beginners, experienced learners, and everyone in between, we’re here to prove that the road to driving doesn’t have to be long. 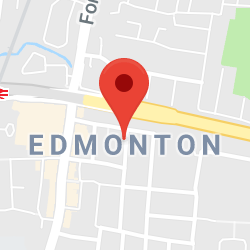 Learn more about the lessons we offer in the Enfield area, including Edmonton, Southgate, and more. Tired of traditional driving schools offering only one hour per week—but also don’t want to cram all of your lessons into one week? Don’t despair! PassMeFast offers a different solution: a range of intensive and semi-intensive courses that can help any learner to pass in just weeks after booking. Interested in automatic driving lessons in Enfield? Finding clutch control tricky? Hate gear changes? Wish you could avoid them altogether? With an automatic car, you can! Some learners find switching to auto helps save that bit of extra hassle, making the road to passing that little smoother. With PassMeFast, you can choose whether to learn in a manual or an auto. Just remember: prices may vary depending on transmission, and if you pass in an auto, you can’t drive a manual after you pass! …your fast-track practical test, which we’ll book at a time, date and test centre to suit you. We’ll even beat the standard DVSA waiting times by weeks—or even months! Plus, with home and workplace pickups available, and lessons that fit around your schedule, PassMeFast is the fast but flexible driving school. Take our 25-hour course, for example: with our intensive course pace, you can complete all your lessons in a 5 day period—or, if you’d prefer something slower that fits around a busy schedule, you can spread your lessons out over a few weeks. Don’t wait around for the freedom of the open road. Book in with PassMeFast today: call us on 0333 123 4949, or click the button below. Here at PassMeFast, we’ll structure your test around a practical test date, ensuring you have an endpoint to work towards and don’t have to wait around at the end of your lessons. Learners in the Enfield area will find their closest option is the Enfield (Innova Business Park) test centre, found close to junction 25 of the M25. For information on what will happen during your test, and tips on how best to prepare, visit our resources page. Greater London has only eight theory test centres between its population of well over 8,000,000. 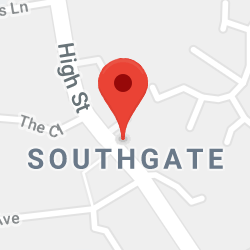 Luckily, one of those eight centres is right here in the borough of Enfield: Southgate theory test centre. 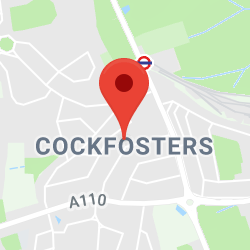 This is right around the corner from Southgate tube station, meaning it can easily be reached on the Piccadilly line. If you’re heading there soon, be sure to check out our last-minute theory test tips! Remember that you’ll need to take your theory test before your practical test—you can’t book a practical without a valid theory test pass certificate! If you haven’t passed yet, add a theory test onto your course when you book. 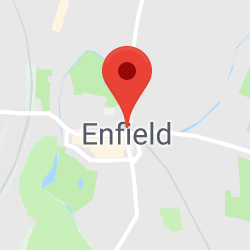 Though Enfield’s test centre is located at the Innova Business Park on the northern edge of the borough, you’ll need to gain experience driving across the entirety of Enfield—and beyond, as test routes here extend into other boroughs, and even into neighbouring Hertfordshire. In fact, one of the trickiest stretches of road to master here is the roundabout linking the A10 to the M25 on the way to Cheshunt—though learner drivers are allowed on motorways now, veering off onto the London Orbital is something you’ll almost definitely want to avoid! It’s not all dual carriageways, of course—your driving lessons will cover everything from knowing when you have priority at a junction through to parking forwards and backwards in a bay. There’s a lot to take in, but by the end of it, you’ll know everything you need to be able to impress your driving examiner and ace your test. So, don’t shell out for a false promise of a “guaranteed pass”—come to a school that nurtures your skills, so you become a safe and confident driver for life. PassMeFast courses aren’t only available in Enfield. In fact, we offer our courses throughout Greater London—and beyond. For more information about nearby areas we cover, check out the links below. If you’re ready to get behind the wheel, we’ll hand you the keys. Simply call us on 0333 123 4949 to book your course—or get everything sorted online by clicking the button below.